The album will include twelve original songs total (over 60 minutes of music), and features all three singers on every track. A blend of songs that cover all the different heavy metal styles, the album features some of the most incredible metal vocal performances ever put to tape. Also included is cover art by Marc Sasso (who has previously worked with the likes of Dio, Halford, Cage, and Adrenaline Mob), while the CD will feature a 16-track digi-book, packed with incredible visuals and artwork. “We couldn’t be more fired up for the album to finally be released. We just got off our European tour and after playing the entire album live for 17 shows, we saw the reaction of the fans to these songs. It was incredible and so we have good reason to be excited for the rest of the metal world to experience this celebration of heavy metal!, said Sean. “This record is a throw-back to the glory days of heavy metal. It will make you feel like you are in high school again!” – Harry This is one for the true metal fans. I think this will exceed even their highest expectations. Great stuff!, adds Ripper. Fans should also note that several special purchasing options are available via Pledge Music, which include bundles, shirts, patches, and other must-haves, please click here for more information. Fresh off of a European tour of 10 countries to promote the release of the album (where the album was performed live in its entirety to rave reviews), the Three Tremors nourish in heavy metal anthems, and feature the illustrious chops of guitarist Dave Conan Garcia, whose tenacity fuels the fire, allowing the music to naturally flow in complimentary tone. Second guitarist Casey Trask picks up the pace and pushes the boundaries alongside bassist Alex Pickard, who highlights a melodic sensibility giving character to the overall tonality. On drums, the thrash machine Sean Elg adds in his perfectly placed fills and signature double bass patterns. 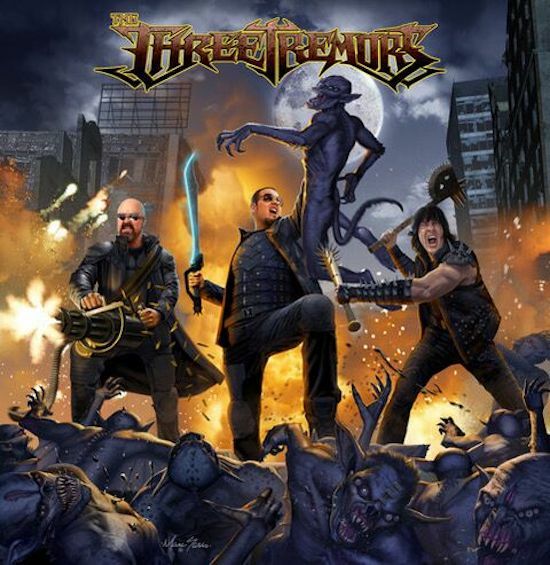 And in 2019, metalheads will finally get to hear what will undoubtedly be one of the most vocal-heavy metal releases of all-time, by the Three Tremors. Quite a sales pitch. The only one of these guys I’ve ever heard of is Ripper Owens. Barely heard of any of their bands listed too. Still I like the sense of humour in the group name and album cover and I’m kind of curious. Totally agree, Waverider! Ripper Owens is a terrific singer, no doubt. Never heard of the other two guys, or the bands they came from. “Metals greatest vocalists” is a pretty big statement, though. Unless I see the names Rob Halford, Ozzy Osbourne, Ronnie James Dio, or Bruce Dickenson associated with that statement, color me skeptical. But I might have to check this out, just to satisfy my curiosity. If you like Priest style music, check out Sean Peck’s band, Cage. They are a good, San Diego based metal band that have been around for a while. Unfortunately, in San Diego, Sean’s “claim to fame” is his much publicized verbal confrontation with Ryan Leaf of the former San Diego Chargers rather than Cage’s musical success. The guitarist named above, Dave Garcia, also is the lead guitarist, and a principal songwriter, in Cage. I’ve been wanting to check out Peck’s work with Denner/Sherman, mostly cuz of the Mercyful Fate connection. Has anybody heard the music? You’re kidding me right? You’ve never heard of Cage or Sean Peck and this is somehow the articles problem and not your lack of knowledge? Cage has been shredding peoples ears since like 97/ 98 I believe and Seans voice is insane. I’d list ALL of the albums however, you need to do your own due diligence. Harry aka The Tyrant, has been around since Jag Panzer in the early 80’s. ANYONE who knows metal would know that instead of thread bombing this article with zero knowledge. I just seen Jag Panzer in Colorado Springs a few months ago actually. I’m shocked you even knew who Ripper was. Kudos…. Exactly! Now, all we need is Fred MacMurray and this thing’s a total success! Hey Rattlehead/Waverider/Keith. Sean Peck has got a pretty killer voice. Cage, Death Dealer, and Denner Sherman are all pretty cool. Here’s an Official Music Video he put out with Denner Sherman last year https://www.youtube.com/watch?v=KdFlFM-OObw&app=desktop I interviewed Sean and Tim last week and I truly believe in this project. I’m not gonna plug myself here because I don’t think that’d be cool. But I will say Ripper wouldn’t have worked with Sean if he didn’t think it was worth it. Hey Scotty, thanks for sharing! I thought that was great song! I just purchased both of their Metal Blade releases. I look forward to getting them. Admittedly, this sort of metal ain’t my cup of tea, but listening to the songs and reading the lyrics, I couldn’t help but laugh. They’re hilarious in that Spinal Tap sort of way. Robert, I didn’t mean to come off as a troll and I respect that these guys are trying to make a living as professional musicians. But should I have to do deep due diligence to have ever heard of “metal’s greatest vocalists”? The use of that phrase is really my only issue with this piece of promo. In my opinion they should dial down the hyperbole a little and keep it a bit more real. You do not need to apologize to me, nor to anyone else, for that matter. I have been into metal since I was 13, and other than Ripper Owens (whom I only knew about, because Priest is my favorite band), I had never heard of the two other vocalists, either. I don’t think that makes me ignorant, perhaps I did not have the opportunity to be exposed, or the genre did not hold any interest. Your entitled to express your thoughts, and just because someone feels you are lacking the knowledge, does not mean they need to reprimand you, nor make you feel guilty, about your opinion. A more effective, and respectful response would be one that is didactic, rather than critical. Robert, I agree the promo ‘oversells’ these guys, but it doesn’t matter…IMO, that’s just publicity to hype things up, so I don’t read into it too much. You’ve got to be your biggest fan, so I think they’ve accomplished that…I’ve only heard Ripper and Peck sing, and I think they’re both good vocalists, but I think Halford and Dio are The Greatest, and untouchable, metal vocalists. And Dana, I concur not knowing who these artists are does not make one ignorant. You have introduced me to a few bands that never would have appeared on my radar cuz of my music preferences. So, thank you for that, and I hope you continue to do it in the future.